Welcome Back to My Creative Time's 41st Release! and of course I just had to make a Paddy's day card!! I love the frames around these two tags from the new set, so cool!! Gorgeous card in greens! I love it, happy St. Patrick's Day. WOW What a beautiful St. Patty's Day card lovin' the greens. You totally outdid yourself...your card is amazing and love the creative ways you've used Miss Emma's goodies Thanks for all the inspiration. YOU so ROCK!! Happy St. Patty's day!! what a awesome card! I live all the greens! Lucky of the Irish! Happy St Patty's Day!! Love your card! So cute!!!! This is darling! Love the pretty greens! What a pretty, bright and festive card!! Love what you created and all of the products you used! Love your St. Paddy's day card! Gorgeous patterns and the tags work just perfectly! Just a perfect St. Pattys Day card! Reminds me of spring! Gorgeous St. Patrick's day card! Love it! Amazing job! This card just makes me smile. Very cute St. Patrick's Day card! I just love all the bright green colors of DSP you used. Happy St.Pat's Day! Adorable card Brigit! Happy St. Patrick's Day! Wow, love what you did with the tags and that paper is popping! Happy St. Patrick's Day! Great card. Lovin' this frame die! Your card is so bright and cheerful! Perfect sentiment! I love the pretty greens you chose to use...so bright and happy. I love the new tags and frames...the outline adds so much to tags. Beautiful job on your card. 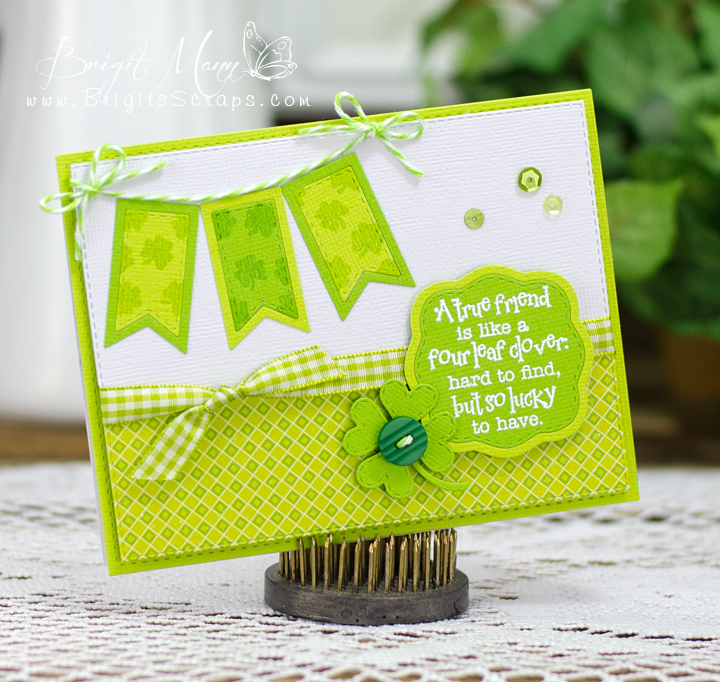 Super cute card...love the different shades of green that you have used on your card. Thanks so much for sharing!! LoVe your wonderful St. Patty's Day card. Thanks for sharing. Fabulous card! Love the green and the adorable banner. So fun! Fun fun Love those layered tags and the bright green! The Limeade Trendy Twine is the perfect touch! What a pretty St. Pat's card. Lovin' your green for St. Patrick's Day! Those tags look so cute as a banner. Great St. Patrick's Day card. Love the greens and the dies are great. Perfect St. Patrick's Day! fantastic card! Perfect colors, embellishments, and layout. Fabulous card in green and cute sentiment. LOVE LOVE LOVE your St. Patty's Day card!!! I really live your card colors! So cute and cheery, Brigit. Happy St. Patrick's Day! Awesome card to celebrate St. Patrick's Day! Happy St. Patrick's Day & Your Card Is So Fitting For Today! Love The Different Shades Of Green! My Creative Time's 41st Release Blog Hop!